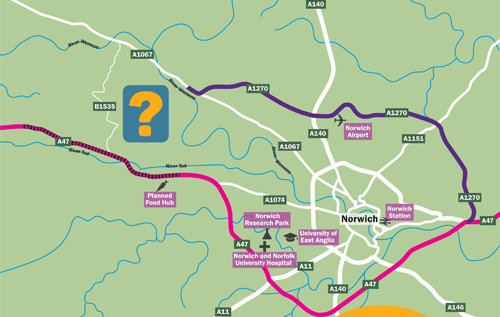 Transport consultation: does Norwich need a western link? Norfolk County Council will be holding a public consultation at the Hall for All, Church Street, Weston Longville NR9 5JU, on Tuesday 22 May from 10.30 am – 8 pm, as well as at other venues and dates, to get views on transport issues that exist to the west of the city. When the County Council announced plans to build the now completed Norwich Northern Distributor Road (A1270) north and east of the city, many people said they were concerned about transport issues to the west of Norwich. Many wanted the Council to fill in what they saw as a “missing link” between the Fakenham Road (A1067) and the A47. As a result, a number of consultation events will be held between Tuesday 8 May and Tuesday 3 July. Find out more and respond to the consultation online at www.norfolk.gov.uk/nwl from Tuesday 8 May. There will be nine consultation events being held throughout May and June, where County Council staff will be available and responses to the consultation can be made in person.